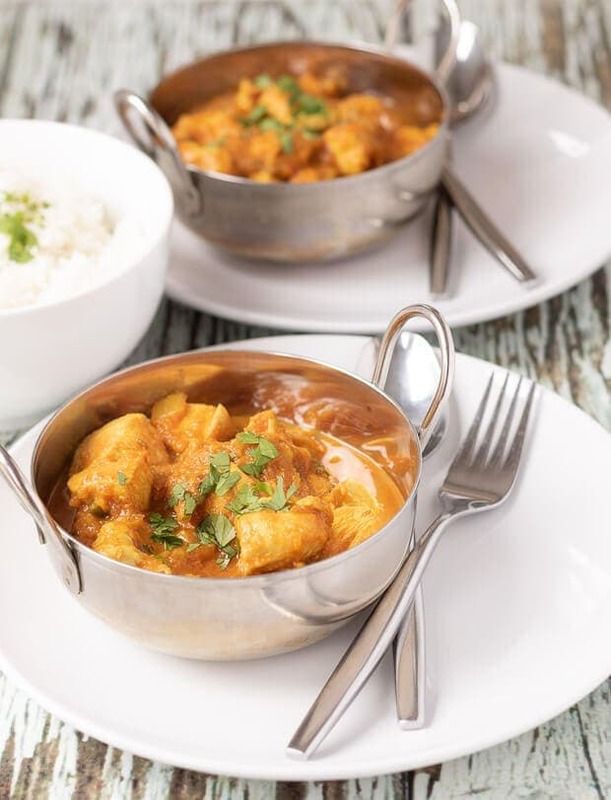 This easy chicken sharabi curry recipe shows you how to make a delicious curry made with a kick of alcohol – in this case wine. This is an amazing curry made from spices, tomatoes and green chillies which combine to provide an altogether amazing fusion of flavours! Folks today I’m bringing you this taste tantalising chicken sharabi curry. Here I’ve adapted an original chicken sharabi recipe I learnt a few years ago when attending an Indian cookery class. In my recipe I’m using just 1 tablespoon of vegetable oil and my blender to break down the onions. This means the recipe still retains ALL the flavour of the original one, but not ALL the calories. It’s also simpler to make, but still as delicious! 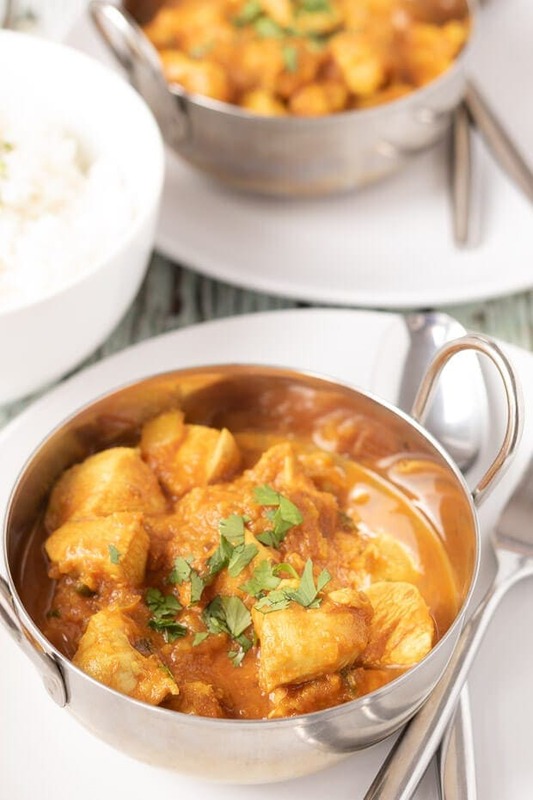 This chicken sharabi is a medium spiced curry but you can vary the amount of green chilli you add to the recipe to suit your own spice tolerance / taste. 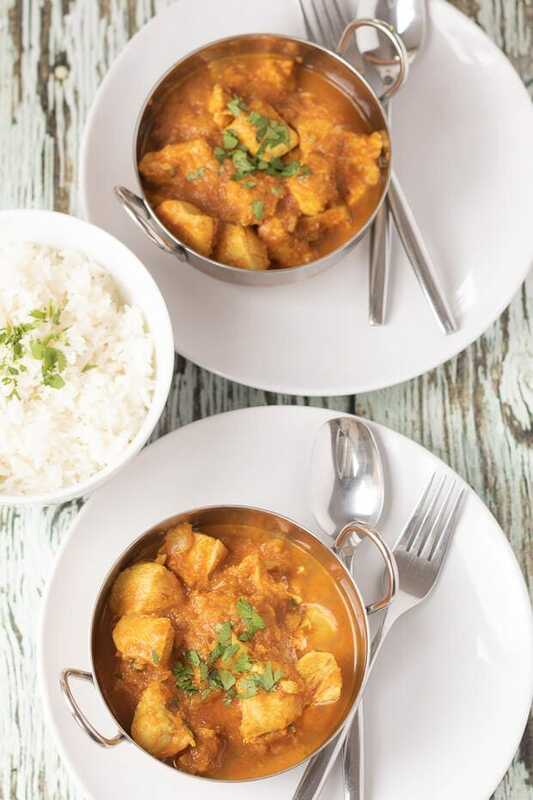 I’m well aware that chicken curry is a family favourite, but this isn’t just your ordinary chicken curry recipe. This one is really special and it’s Lady Lynne’s favourite too! Indeed I no longer ask her what curry she wants for her “Sunday Curry” as I always get the same answer “Chicken Sharabi”. I’d end up making the same curry every Sunday! To serve this Easy Chicken Sharabi Recipe you may need…. The following links and any links in the recipe card below are affiliate links – which means that if you click on it and then buy that product I’ll get a small commission (at no extra cost to you of course). If you do click through then thanks for being a part of Neil’s Healthy Meals! These are the balti dishes I use to serve my curries. You’ll see these dishes in most of my curry recipe photographs as well. They add a perfect authenticity when serving your curry. For a very reasonable price you get 6 of these high grade stainless steel authentic Indian balti dishes. They’re easy to clean and you’ll enjoy them for life! Serve your chicken sharabi with rice or an Indian bread. If it’s a bread you prefer and you don’t have time to make my Home Made Naan Bread and you want to keep the calories as low as possible then choose Roti at your supermarket. Roti breads are made with wholemeal flour. 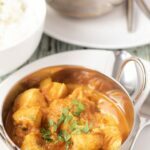 This easy chicken sharabi curry recipe shows you how to make chicken sharabi which is a delicious chicken curry made with alcohol, in this case wine. Gently heat the oil in a medium sized saucepan then add the onion and cumin seeds and fry until the onions are softened. Stir in the turmeric, ground coriander and garlic and ginger paste and stir through for a minute or so. Add the chopped tomatoes and salt, bring to the boil then turn down to simmer for a couple of minutes. Blitz the onion and tomato mixture in a food processor until pureed. Return to the saucepan, gently heat and then stir in the water and red wine, green chilli paste and tomato ketchup. Allow the curry sauce to return to the boil then turn down to simmer. Season to taste. Add the chicken, coating well in the sauce and cook for about 15 minutes, stirring throughout to ensure the chicken is cooked through. Serve on rice of your choice**, garnished with the freshly chopped coriander. *If green chilli paste is not available then use finely chopped, green chillies with their seeds left in. **wholegrain basmati rice is healthier if you can get it. Check out my other Curry recipes here. Curry is one of my favourite meals to make and you’ll easily find a selection to suit all tastes including vegetarian and vegan ones. 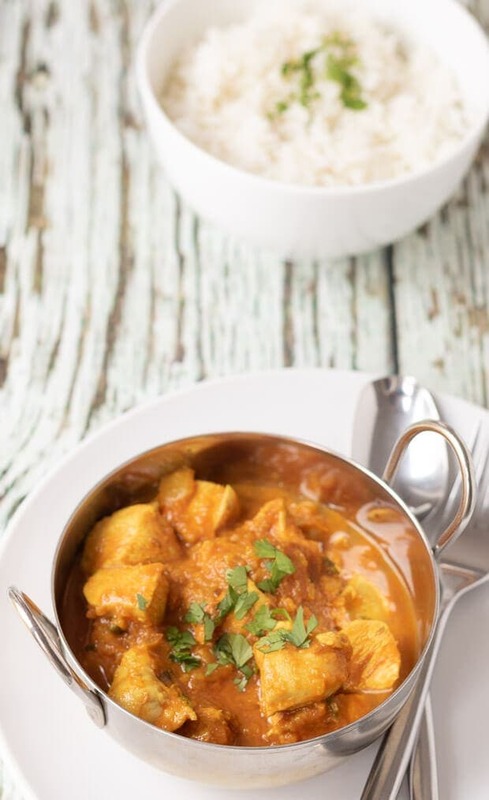 Meat eaters looking for the ultimate in quick to make curries are sure to love my Chicken Curry In a Hurry! OK so moving on to next week. We’ll start with a new tasty breakfast/brunch recipe on Tuesday, Chorizo and Egg Breakfast Burritos. And it’s been a while coming but on Thursday, a brand new no bake blueberry cheesecake recipe! Woohoo! Thanks David. As I mentioned in the write up this is Lynne’s favourite curry and she even sings about it! 😆 Maybe this could be Laura (and your) favourite curry too?